MARCH 12, 2018 – BISHOP, CA –The Eastern Sierra Land Trust (ESLT) announces the completion of their largest conservation easement to date on Sceirine Point Ranch, showcasing how conservation and sustainable agriculture effectively work together. Owners Joe and David Sceirine have sold an agricultural conservation easement of 2,375 acres that will protect native grassland, the greater sage-grouse and mule deer, while allowing the property to be used for livestock grazing. For three generations, the Sceirine family has owned and operated a successful beef cattle ranching business in Bridgeport Valley, an emerald valley crowned by the peaks of Yosemite National Park located between the ghost town of Bodie and Yosemite National Park. This high mountain meadow is laced with creeks and wetlands, providing a haven for diverse wildlife such as mule deer, waterfowl, migratory songbirds, and some of the best habitat in California for the greater sage-grouse. Conservation easements protect land for future generations while ensuring owners retain certain property rights. Through an easement, landowners transfer only those rights necessary to protect specific conservation values, such as wildlife habitat. Easements are individually tailored to meet a landowner’s goals and the conservation values of the land. Because the land remains in private ownership, with the remainder of the rights intact, an agricultural easement property continues to provide economic benefits for the region in the form of jobs, productivity, and property taxes. Much of the funding for this project was provided by USDA’s Natural Resources Conservation Service (NRCS). NRCS provides financial and technical resources that help landowners and partners protect the nation’s most productive grasslands, wetlands, and agricultural lands by providing funding to purchase easements on private working lands. NRCS’ Agricultural Conservation Easement Program that protects grasslands of special significance was an ideal funding vehicle for Sceirine Point Ranch because of the habitat the ranch provides for Bi-State greater sage-grouse. It is the first of several pending projects using NRCS funds, which come from the 2014 Farm Bill. Additional funding was secured from the Sustainable Agricultural Lands Conservation (SALC) Program. The SALC Program is part of California Climate Investments (CCI), a statewide program that puts billions of Cap-and-Trade dollars to work reducing greenhouse gas emissions, strengthening the economy, and improving public health and the environment—particularly in disadvantaged communities. The Cap-and-Trade program also creates a financial incentive for industries to invest in clean technologies and develop innovative ways to reduce pollution. In addition to helping conserve important grasslands and supporting the local ranching community, this agricultural conservation easement prevents Sceirine Point Ranch from conversion to residential or commercial development or crops. Preventing these changes and maintaining the native grassland will avoid greenhouse gas emissions equivalent to 45,637 metric tons of carbon, according to an analysis by the SALC Program. The project also received a grant from California Deer Association, a privately funded sportsmen’s group that improves habitat for California deer herds and other wildlife through direct financial support for habitat improvement and research projects. 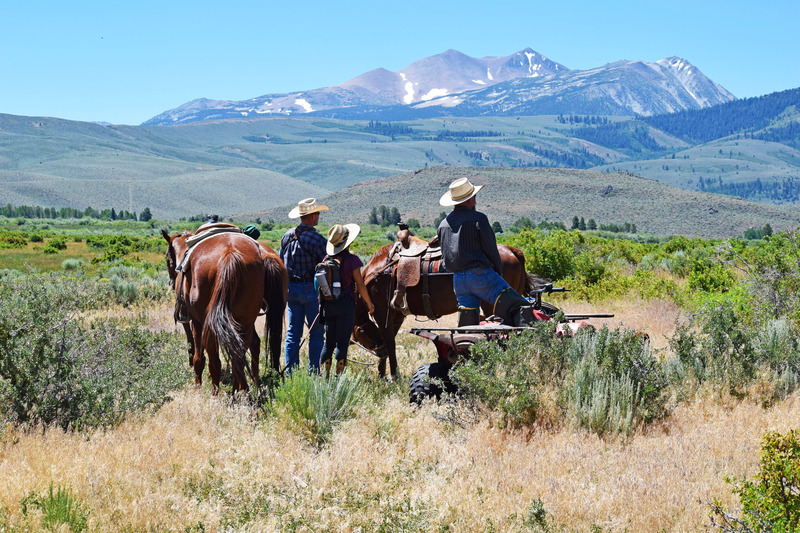 Eastern Sierra Land Trust works with willing landowners to protect vital lands in the Eastern Sierra region for their scenic, agricultural, natural, recreational, historical, and watershed values. To learn more about ESLT’s work and how to get involved, visit www.eslt.org. The Carpenter Valley acquisition is 1,320 acres just north of Truckee’s Town boundary and Tahoe Donner. It includes over two thirds of the Valley comprised of a pristine meadow, healthy stands of willows, and two miles of the North Fork of Prosser Creek. More specifically, Carpenter Valley contains a variety of habitat types and is a top priority for biodiversity conservation in the Sierra Nevada. The entire Valley, thanks to conservation-minded private landowners to the west and the previous owners, provides an extremely large, complex mixture of high quality Sierran habitat. It includes wet meadow, fresh water emergent wetland, riverine, and fen habitat types, as well as red fir, lodgepole pine, and mixed-conifer forest. It supports wildlife species including black bear, mountain lion, bobcat, coyote, and various bird species and is summer range for the Loyalton-Truckee deer herd. Several special-status species are likely found in Carpenter Valley including willow flycatcher, wolverine, mountain yellow-legged frog, and Pacific fisher. If the Land Trust and its partners had not acquired the 600 acres in the lower meadow, it could easily have been subdivided into seven estate parcels. The impacts from development would be devastating to the meadow and rich habitat the lower meadow provides. “The Land Trust has done bigger deals in terms of ‘bucks and acres,’ but very few as important from a bio-diversity and ecological perspective. The resource values are unique, highly functioning and near pristine,” said John Svahn, the Land Trust’s Associate Director. Given its size, healthy geomorphic condition, and hydrologic regime, Carpenter Valley retains a large quantity of runoff from the Sierra Crest. During the summer, the meadow feeds Prosser Creek with clean, cold water, that in turn sustains high quality aquatic habitat in Prosser Creek and the Truckee River. It is, in short, an example of how a subalpine Sierra meadow should work. Federal and state officials have identified the North Fork of Prosser Creek that bisects the meadow as ideal for the recovery of native Lahontan cutthroat trout. These federally threatened fish have been documented in the creek as recently as the late 80s and may still be present. The first phase of the acquisition closed over a year ago. The Land Trust purchased 620 acres that included Crabtree Canyon, recorded a conservation easement on the property, and resold it to Tahoe Donner Association for inclusion in their summer and winter trail system. Other critical partners include the Wildlife Conservation Board, the California Natural Resources Agency, Tahoe Donner Association and the Skyview Foundation. Granite Bay, CA—Placer Land Trust has announced the permanent protection of 27 acres of oak woodlands and wetlands in Granite Bay – land with special historical significance to local Native Americans. A recent mitigation agreement between the landowner, Amazing Facts Ministries, and the U.S. Army Corps of Engineers allows adjacent land to be developed for a church, while granting Placer Land Trust a conservation easement on the 27 acres. Placer Land Trust is a nonprofit working with willing landowners to permanently protect natural and agricultural lands in Placer County. “Our conservation easement permanently prohibits subdivision, development, and other activities that would be harmful to wildlife habitat, wetlands, Granite Bay water quality, and the historic character of this beautiful land,” said Jeff Darlington, Placer Land Trust’s Executive Director. The land is located nearby to a historic Nisenan village named Odayan, and Placer Land Trust has renamed it “Odayan Preserve” in recognition of the many past generations of Nisenan land stewardship. “We’re pleased to see the Nisenan heritage honored here, and we thank Placer Land Trust for permanently protecting this land from development,” said Matthew Moore, Tribal Historic Preservation Officer at the United Auburn Indian Community. Odayan Preserve is on land privately owned by Amazing Facts Ministries, and is not open to the public. Placer Land Trust will manage and monitor the property to ensure the wetlands and cultural values are protected in perpetuity. Funding for the ongoing stewardship of the property was provided by the landowner through the mitigation agreement. Placer Land Trust is a 501(c)(3) nonprofit public benefit organization incorporated in 1991 that works with willing landowners and conservation partners to permanently protect natural and agricultural lands in Placer County for future generations. To date the Trust has protected over 8,100 acres in 40 locations across Placer County – including farms and ranches, riverfront lands, wildlife preserves, scenic open spaces, public parks and recreation areas, and lands with significant cultural and historical significance. For details, see www.placerlandtrust.org or call (530) 887-9222. Nevada County – September 1, 2016At 7,000 feet elevation in the high Sierra Nevada, three alpine lakes and 2,000 remote acres of forest and granite landscapes important to outdoor recreationists are now permanently protected by Bear Yuba Land Trust (BYLT) on land owned by Pacific Gas and Electric Company (PG&E). This month, Fordyce, Meadow and Sterling lakes became protected forever in conservation easements by BYLT, a community-supported conservation group with a 26-year foothold in the Bear and Yuba watersheds of Northern California. The conservation deal was stipulated as part of PG&E’s bankruptcy settlement in 2003 when the utility company – considered one of the state’s biggest private landowners – agreed to permanently protect the beneficial public values on the watershed lands associated with its hydroelectric generation facilities. 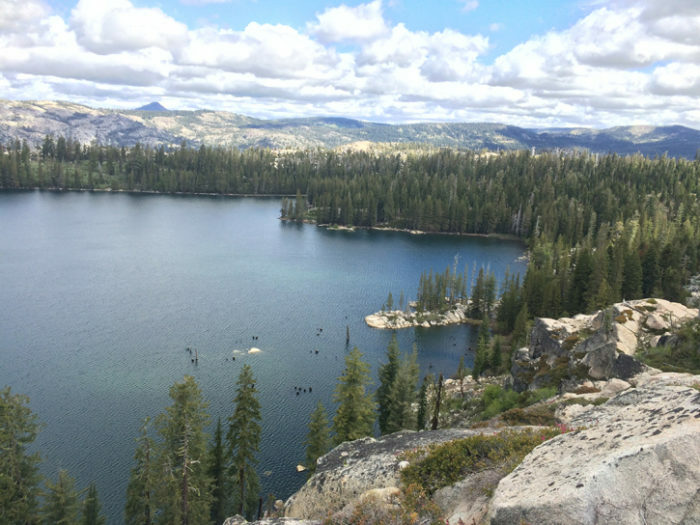 “BYLT’s protection of these high elevation reservoirs is a huge victory for the Sierra Nevada,” said BYLT’s Director of Land Stewardship Erin Tarr. PG&E impounds the water in Fordyce, Meadow and Sterling reservoirs for hydroelectric operations via a complex network of canals and creeks downstream at Lake Spaulding. More than 60 percent of California’s developed water supply originates in the Sierra Nevada providing all or part of the drinking and agricultural water for 23 million people, according to Sierra Nevada Conservancy. Land stewardship within the watershed is crucial to preserving a reliable water supply and improving water quality. In 2004, as part of PG&E’s bankruptcy settlement, Pacific Forest and Watershed Lands Stewardship Council was established to work with land trusts to ensure 140,000 acres of California’s pristine PG&E watershed lands in the Sierra Nevada, Cascades and North Coast Range are conserved for the public good. The newly conserved acreage around the three reservoirs in Nevada County supports habitat for a diverse range of wildlife including special status species such as: American martin, Pacific fisher, mountain yellow-legged frog, and the elusive California wolverine, last spotted near Truckee. “Climate change impacts have the potential to change the way our water is captured and transported,” said BYLT’s Stewardship Director Erin Tarr. “Now that BYLT has permanent conservation easements on these lands we will ensure the biological and recreational values are protected forever. Even if a change of ownership occurs, development will not be possible on these lands,” said Tarr. BYLT’s conservation easements border one of Tahoe National Forest’s most popular outdoor meccas, Grouse Ridge Non-Motorized Area. Nearby the Pacific Crest Trail and mountain resorts on Donner Summit draw hordes of weekend outdoor adventurers from the Bay Area along busy Interstate 80. “Rock crawling” OHV clubs have popularized the area and Friends of Fordyce keep a caretaker presence. Year-round public recreation is permitted such as camping, fishing and back country skiing. Fordyce Lake is the largest of the three lakes but more challenging to access than Meadow Lake. Boy Scouts lease a camp at Sterling Lake. The land is considered vulnerable because of its location within the “Sierra Nevada Checkerboard,” a mosaic spanning several thousand acres of public and private ownership shared with Tahoe National Forest, Nevada Irrigation District, Sierra Pacific Industries, and private interests dating back to the construction of the transcontinental railroad in the 1860s. As an early day incentive, the federal government offered railroad companies “every other square mile” of land in the Sierra Nevada, reserving the intervening sections to become National Forest. “The result has been a lack of consistency in land management and land use patterns. This has caused fragmentation of the landscape that degrades the integrity of the watershed for healthy forests and wildlife habitat,” said BYLT’s Executive Director Marty Coleman-Hunt. “Worse yet, if left unprotected, these private parcels of forestland may be converted to rural sprawl – second home mansions and commercial resorts – over the next 10 to 20 years. We are seeing real estate acquisitions like these already in our mountains. Land trusts offer landowners who care about conservation an alternative to selling the land to the highest development bidder,” she said. In a nutshell, a conservation easement is a voluntary, legally binding agreement that prevents a willing landowner and its successors from developing or subdividing a property and to protect its natural resources and biodiversity in perpetuity. In essence, development rights are forfeited and no longer exist. Meadow Lake includes the former site of Summit City, a town of 4,000 during the Gold Rush. In the early 1850s, stage stations in the region provided fresh food for travelers across the Sierra Nevada to the gold fields. Besides boarding horses, mules and cattle, Jerome Fordyce and his partners built a large number of distribution reservoirs and canals, and dammed 20 small lakes to increase their capacities. Fordyce dam was begun in 1873 as the main storage reservoir for the South Yuba Canal Company. By 1882, the dam reached 96 feet, the largest dam in California at that time. About 18 electric companies emerged along the reservoirs, which were ultimately absorbed by PG&E by the 1920s. With the addition of this mountain landscape, BYLT’s portfolio of conserved land has grown to nearly 11,000 acres in the Bear River and Yuba River watersheds of the state’s renowned Gold Rush country. BYLT’s newest conservation easements are the third and fourth PG&E projects to close in recent years, following two lower Yuba River properties in 2015: PG&E Narrows in Nevada County and UC Narrows in Yuba County. Eight more planning units are scheduled to move into permanent protection by 2018, for an additional 10,000 acres. They include: Lindsay Lakes and Grouse Ridge lands, Lake Spaulding, Deer Creek headwaters, Bear Valley and 17 miles of the Bear River between the headwaters and Rollins Lake.